Photos by Noah Christman for SPUR. The Stockton Street Enhancement Project, spearheaded by Chinatown Community Development Center (CCDC) and SPUR, brought Chinatown and SPUR stakeholders together to discuss ways to preserve the economic and cultural vitality of Stockton Street while offering opportunity areas for improvement through the next decade. The project, made possible by a grant from the National Endowment for the Arts, included a walking tour and two workshops designed to address issues with the highly trafficked corridor. Stockton Street has evolved over the years to become an example of true urbanization, replete with a strong transit network, multigenerational families living in tightly knit spaces, hundreds of mom-and-pop stores and a bustling streetlife. It has a dense immigrant population and plays an important role as a regional hub for both Asian Americans and tourists from around the world. Its success lies in its strong history of grassroots organizing to protect Chinatown’s affordability, culture and urban form. Buildings along the corridor are typically mixed-use — with retail on the ground floor and housing above — and between three and four stories in height. In addition to storefronts, there are also many social services and institutions (i.e. 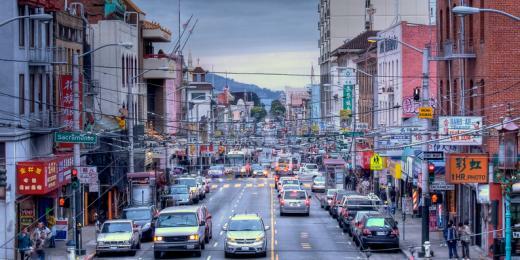 health, education, religious and family associations) that line the busy blocks of Stockton Street. A timelapse video of Stockton Street shows the challenges of navigating this heavily used corridor. Video by Michael Waldrep. The residential base, small businesses and marketplace feel are assets that should be preserved and enhanced as the neighborhood experiences change from major public projects such as the new Central Subway. Connecting Chinatown to Union Square and SoMa before fusing with the existing T-Third line as it extends to Visitacion Valley and the Bayview, the Central Subway could prove to be an catalyst for change along the Stockton Street corridor, reshaping the street’s usage patterns and drastically changing its character. The community planning process framed by CCDC and SPUR sets the overarching vision of how to preserve and enhance the neighborhood amid these oncoming changes. With an estimated 20,000 people living in Chinatown’s 30 square blocks, many of whom are crowded into 8-by-10-foot single room occupancy units, Chinatown is the city’s most densely inhabited neighborhood. The average median income of these residents is $18,000 per year, with more than a third of the population being seniors who live on fixed incomes. The neighborhood is made up of 88 percent renters, and only 10 percent of households own private vehicles. Future plans for Stockton Street must take into account the needs of the people who live in Chinatown by focusing on the creation of safe streets, affordable housing, open space, timely and efficient transit and access to social services and educational and religious institutions. Stockton Street is also an important cultural and social hub for Asian Americans from many of San Francisco’s immigrant neighborhoods, including Visitacion Valley, SoMa, Outer Mission and Excelsior, who take the 30, 45 and 8X buses that pass through the corridor. Other Asian Americans enclaves in the Sunset, Richmond, East Bay and South Bay depend similarly on Muni and BART as their connection to Chinatown. Regardless of their location, San Francisco’s Chinatown serves as the confluence for the Bay Area’s Asian Americans, with a large proportion of them attending school, worshipping, visiting friends or shopping in the neighborhood. Through a walking tour and two workshops, one held in Chinatown and one held at the SPUR Urban Center, Chinatown CDC and SPUR implemented a rigorous community engagement process to better understand the needs along Stockton Street. These public discussions brought together a diverse group of stakeholders — including monolingual residents living along the corridor, local merchants, property owners, architects and planners — to talk about potential opportunities for change. Bilingual and bicultural, the workshops were conducted to be participatory and engaging for all groups involved. At the start of each workshop, SPUR and CCDC staff analyzed the current state of the Stockton Street corridor and shared case studies, both local and international, as possible models for its future, after whichparticipants divided into smaller groups to run through three different brainstorming exercises: 1) current strengths and challenges of Stockton Street, 2) priority areas to focus on for its future and 3) the connection of the future Chinatown Central Subway Station to Stockton Street. 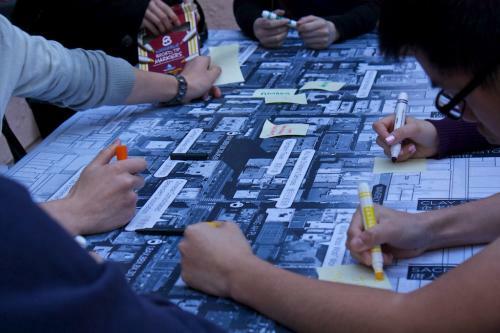 Participants quickly discovered that there is no single solution for Chinatown’s Stockton Street. On the contrary, there are many elements that work well, but have also proven to be challenges for functionality. For example, retail displays encroaching on to the sidewalk may initially seem innocuous and complementary to the street’s character, but when combined with open basement trapdoors, parking meters, unloading trucks and a multitude of newspaper stands these components quickly narrow the navigable sidewalk space. Workshop participants record their ideas for Stockton Street. Participants noted a similar dichotomy with the corridor’s transportation options. While the continuous flow of Muni buses provides near-seamless transit connections, their frequent stops also create traffic congestion. With pedestrians often forced into the street due to sidewalk obstructions, this congestion brings with it very real danger. Compounding this is the lack of open space along Stockton Street, with only Willie “Woo Woo” Wong Playground providing an oasis from the activity of the street. In the second exercise the workshop groups identified many of the same priorities and solutions for the corridor. Short-term proposals included restricting loading and unloading during peak pedestrian hours, consolidating sidewalk stands and beautifying the street through painting, cleanup and improved lighting. Participants looked to similar streets around the world for ideas, taking inspiration from flexible parking options and sidewalk bulbouts, high-volume bus stops and pedestrian-scale full-spectrum lighting. Long-term ideas posed included eliminating a south-bound travel lane to free up transit and pedestrian flow, creating “flex delivery zones” dependent on the time of day and prioritizing travel lanes through traffic pattern analysis. Also proposed was the idea of “shoplets,” compact retail spaces that take over on-street parking in a similar manner to a parklet. The final brainstorming exercise focused on the role of Stockton Street as the future terminus for the Central Subway. Participants immediately identified the opportunities in crafting the station as a hub of activity, art, business and culture while suggesting plaza space and rooftop decks as a respite from the street, along with improved signage and wayfinding for visitors. Finally, participants felt that the subway station’s construction could prove to be the impetus for the evolution of the Stockton Street corridor and the grand catalyst for lighting, transportation and façade improvements along its extent. 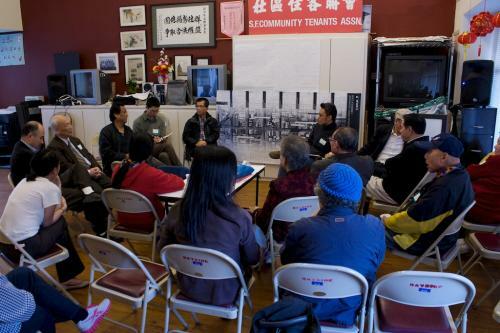 Participants in the Chinatown workshop discuss solutions for Stockton Street. The feedback from the Chinatown workshop resulted in pragmatic ideas for positive and lasting change for the corridor, while the SPUR workshop, comprised mostly of working professionals, came up with more technical and creative thoughts on possible changes. SPUR and CCDC hope the City of San Francisco will prioritize these ideas in their plans as they pursue opportunities within the corridor.